In this work, incomplete factorization techniques are used as smoothers within a geometric multigrid algorithm on triangular grids. 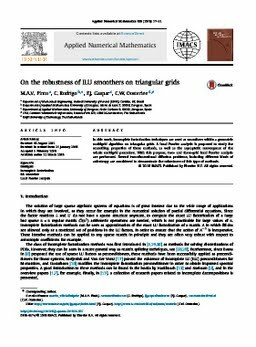 A local Fourier analysis is proposed to study the smoothing properties of these methods, as well as the asymptotic convergence of the whole multigrid procedure. With this purpose, two-and three-grid local Fourier analysis are performed. Several two-dimensional diffusion problems, including different kinds of anisotropy are considered to demonstrate the robustness of this type of methods.